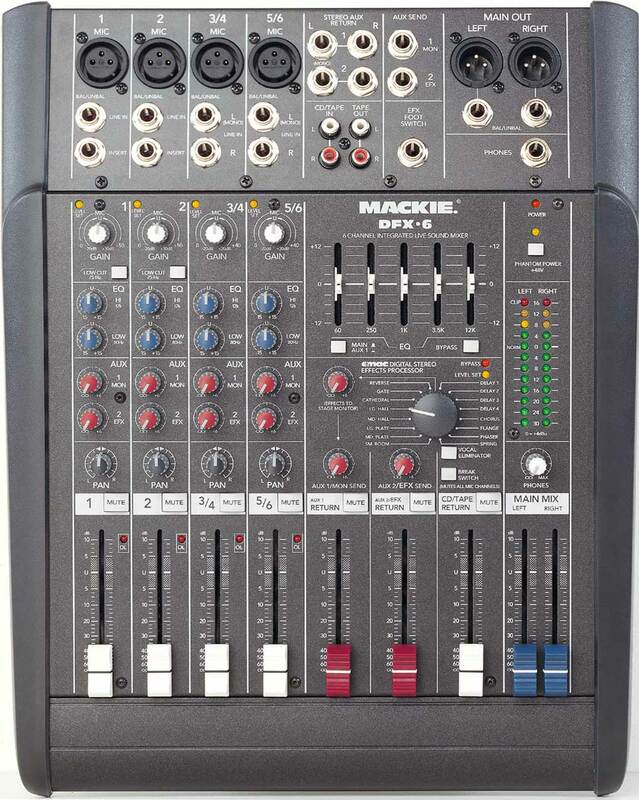 If you're an aspiring musician, sound recordist, broadcaster, stage mixer, podcaster or even an, err, karaoke fan, then the Mackie DFX-6 mixer might be worth a look if you fancy moving up a level or two. Despite its bijou dimensions, this little fella packs a whole load of functionality, with Mackie's renowned ease of use and intuitive controls smoothing the learning curve. 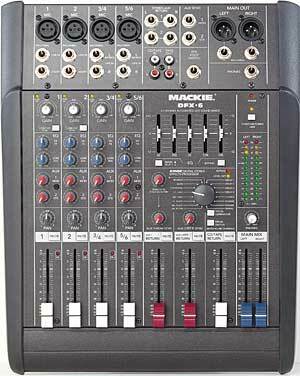 We have to congratulate Mackie on their excellent 24 page A4 manual that accompanies the mixer. Unlike the usual feast of dull, spod-stimulating, techie babble that comes with many complicated electronics, this one is clearly laid out, easy to read and fun (yes, we said fun!) to flick through, with lots of little jokes to lighten the learning load. 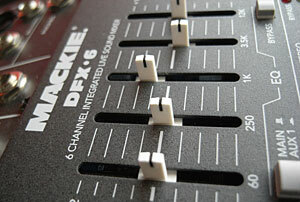 The Mackie DFX6 lets you plug in a mix of microphones and mono/stereo line sources (guitars, bass, keyboards etc) although the 6 channel claim is a bit of a swizz - it's really two mono channels and two stereo channels, so you won't be able to have six microphones or instruments on the go at once. There's a separate fader for the CD/Tape return so you could, for example, have two microphones, a guitar, bass and keyboard going through the mixer simultaneously (if really study the manual there's loads of tricks to get even more things going on, but we're not RTFM types). 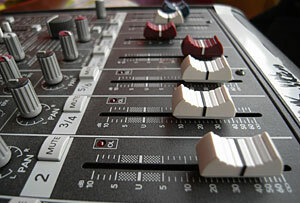 To make things simple, channel faders are white, effects and monitor sends are red and master level faders are blue. The white Tape/CD level fader stands alone, so you're unlike to fade down the wrong thing mid-song. The mixer is made up of four input strips, with mic/line inputs at the top, gain pot plus 'level set' LED, two EQ controls (12kHz High and 80Hz Low bands), Aux 1 (monitor), Aux 2 (FX), pan, mute, 60mm mix fader (we'd have preferred 100mm) and overload LED. The mono channels 1 and 2 come with a handy 75Hz low cut filter, which is great for sorting out microphone rumbles and trouser troubling woofer explosions, and there's an insert jack plus RCA CD/Tape inputs and Tape outputs. 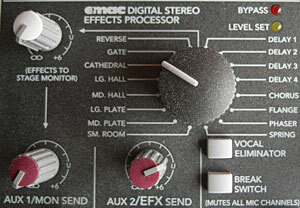 An onboard EMAC 32-bit digital stereo effects unit lets you add a range of effects to channels 1-4, including delay (four levels), chorus, flange, plate, phaser, spring and a set of room echoes. If you're like us, you'll quickly plug in a microphone and instantly immerse yourself in a world of 'amusing' massive echo effects, over the top reggae dub vocals and hilarious noise delay loops until getting a richly deserved clip around the ear from anyone around you. A break switch lets you mute the entire output (don't lean on that one mid performance) while a slightly flippant Vocal Eliminator circuit on the CD/Tape channel has a fairly good stab at removing the vocal from CDs for drunk crowd singalongs or (please God, noooooo!) impromptu karoake sessions. We tested out the Mackie at a small rockabilly gig we were putting on in Brixton, running three vocal mics through the desk along with the bass drum. For vinyl/CD playback we connected up our Numark CD1 Mixer and plugged it into the RCA CD/Tape inputs. We used the monitor mix to feed a single powered speaker onstage for foldback, with the main PA being a 1k rig with a single beefy bass bin for underpant pleasing pulsations. Setting up the Mackie was a breeze, and ably assisted by an audio engineer friend, we soon had the band soundchecked and sounding great. 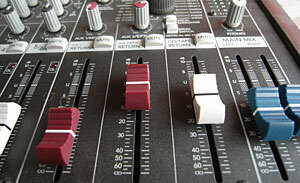 Noise off the mixer (traditionally the blight of all low end mixers) was very low and there was no annoying crackle off the sliders or pots (note: if you want to be down with the sound crew, always refer to a 'knob' as a 'pot.' But only when you're talking about mixers). One disappointment was that it wasn't possible to send the CD mix straight into the monitor mix but after scrambling about through a big box of leads we found a usuable workaround. During the opening DJ set, the 5 band EQ came in handy for filtering out feedback frequencies from our disgracefully cheap pair of turntables and by the time the band were due to go on the place was packed. Unfortunately our sound engineer friend had succumbed to temptation and necked some mind bending drugs in the meantime, so we found ourselves being dropped in the deep end and left to man the mixing desk alone. It could have been a disaster, but thanks to the Mackie's ease of use, we had no problems slipping those sliders like a pro, and both punters and the band seemed well satisfied by our sonic dabblings. The Mackie's tank-like durability proved useful too, as twice an over-enthusiastic pogoing-punter came ricocheting off the mixer before crashing under a pile of coats. And then we dropped the mixer off the table at the end of the night, before a passing drunk trod on it, but it survived intact. 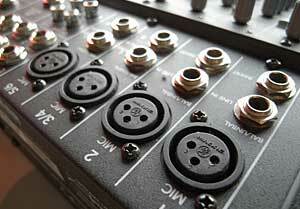 We loved this mixer. It's small, sturdy and simple to use, with enough features to make it a perfect, small scale all-round mixer. In a live situation, we were impressed with its low noise and tough casing, and at home it's a great little unit for putting together sound recordings and podcasts (although the lack of a USB port is a pain). Best of all, with a little shopping around on the Internet, the Mackie DFX-6 can be found for as little as �99 which makes it a truly outrageous bargain. Highly recommended.